In a chaotic world, fragility comes at too high a cost. If you are fragile, chances are you may get badly hurt. If another financial crisis comes in, a crisis so huge the banking system might tank, how will you pay for your expenses with a credit card and no cash? If the huge transportation and supplying system gets cranked and the supermarkets become empty fast, how will you eat with no more than two or three days of food stored in your nice flat? And this is just the tip of the iceberg. No one really enjoys thinking about how our developed yet jittery societies may collapse, but in the course of last years I am pretty sure many, many people did. Being fragile is a luxury. And luxuries, due to not being useful, are inherently fragile. The Japanese have plenty of refined arts but they never made much porcelain, in contrast with China, whose porcelain objects are so famous one can still call these “chinaware.” Why so? Not because they are inept but because Japan is frequently hit by earthquakes. Martial arts and paper walls have a low risk of suffering from earthquakes. Porcelain can only thrive on lands when one can be sure the Earth won’t start shaking overnight. To avoid being shaken as well and, perhaps, even thrive, one must learn to stop being fragile and become at least resilient. Be prepared to whatever may happen, be robust or able to dampen any damage. How does one do that? Well, here is an example of resilience: my resilient home. Based somewhere in Ardèche, south of France, this home is my very own personal hideout. I spend a lot of my time around the world, notably for hosting conferences and delivering lectures about chaos. However, when I get tired of the hustle and bustle, of crowds and constrained spaces, I love going there so much. To be honest, this place is far from being synonymous with dolce vita. The fractal nature of our world does not stop with urban landscapes and, even surrounded with so much nature, I always find myself doing some work—whether gardening, cutting wood, or on my laptop. A bit of everything recurs in everything and the small rests and half-work moments one take at work recur, during holidays, as work. Even then, resting there is always soothing. I have had this house for years and never felt any remorse for choosing this one over many other options. The house, though, is more than a mere hideout. It is also a productive, low-consumption and potentially autonomous basis. If a major catastrophe—another black swan !—happens, this may be a better place to stay than the clogged heart of Paris. What Makes That House Resilient? The neighbors. My neighbors are by far the most important of all and I am so thankful to them. Resilience by yourself does not exist! The architecture. Built decades ago, the house was erected with local stones. Walls were assembled and cemented so that they would stand. As a result, the house stands harmoniously within the landscape, and the walls provide a reasonable thermal insulation: they keep the warmth inside during the winter while providing a refreshing coolness in summer. As risk specialists say, the more a technology has been around and the more it has chances to stick. This kind of walls and architecture has stood for centuries, if not millennia. Thus they also have every chance to stick. The sunlight. 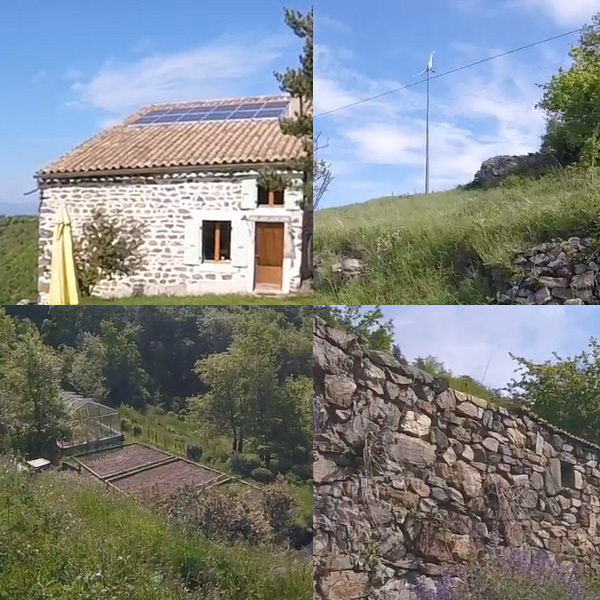 Ardèche benefits from a fairly good weather, with lots of sunny days, and I took advantage of this to install solar panels. Some of these turn the sunlight into power, others turn it into heat so that we get hot water without consuming anything or polluting. The wind. Hilly places tend to be windy as well, airstreams flowing between the ups and downs. The Ardèche is no exception. Besides the solar panels, I mounted a small windmill on a ten-meter high pole. Believe me, this gear is very small compared to the massive windmills one an see all over Europe, yet it produces twice more energy than the house consumes! Surplus energy from the windmill and panels is sold to Électricité de France. Thus, these energy-producing installations help feeding the grid with a renewable, environment-friendly resource while helping me to pay for unavoidable expenditures as well. The wood. I a traditional wood stove and a closed fireplace. Just put a modest amount of wood in there—OK, chopping wood wood is definitely not that easy, but no one said it had to be easy either—and once the fire is properly started you get hours of a gentle warmth radiating all over the place. Organic gardens. A greenhouse allows me to grow tomatoes, eggplants and many other vegetables, while the rest of the land is planted with lemon trees, apple trees and others as well. No organic certifier has visited my gardens, but using absolutely no chemical pesticides, I can tell everything is organic. In a nutshell, thanks to both traditional and modern means, the house uses renewable, prevalent and local resources to produce energy and commodities instead of consuming. This is the key to resilience. Do not depend on external production centers, but be your own center. Home industry has been there for millennia, and while it may seem hard to imagine a world without big plants, it is possible for such a world to exist. On the other hand, home production will likely never disappear. People and plots of land produced before heavy machinery did. We may have trouble living without depending on plants, global transportation and heavy machinery, but we can – whereas depending exclusively on such means would be a breeding ground for catastrophes. The global system of economy and production may adapt or not, and we should sincerely hope it will adapt, but no matter what happens, home production is not going anywhere. At this point, one might notice that my resilient base may be used for survivalist or prepping purposes. “That’s cool”, a friend once told me, “with all that material you can live on your own!” Indeed: in case the big-scale providers fail, the house and its commodities, from food to water and energy, will still function pretty well. However, being on my own is not the ultimate point. If I can choose, I would rather live connected to the grid and beyond than get isolated. Independence is rather a mean than an end. I would rather be a node, trading and contributing to provide others, than one travelling over the land of Nod. Survive if you need to, share as much as you can. Of course, being resilient means being able to face problems and unexpected, not to say unwanted occurrences. Thus, if I happen to get off the grid, the autonomous power system will activate automatically and work with the energy accumulators. The house will still have energy and hot water. I will still be able to heat it. Yet, when the grid comes back, the autonomous system will automatically shut down and start either replenishing the accumulators or feeding the grid as it usually does. The resilient home is not usually autonomous, but it can become so if we need it to be. Here the key is optionality. We don’t mean to be preppers, but in a worst-case scenario, we may be. The other 99% of the time, we can be connected, live harmoniously with both nature and people, and contribute to the well-being of everyone else by producing with no pollution instead of consuming. If you are still with me at this point, you can glance to my book Chaos, a User’s Guide as well or keep with me for an interview with the transportation expert Gabriel Plassat on the future of mobility.